Welcome to Top It Off ! Thank you for dropping by. 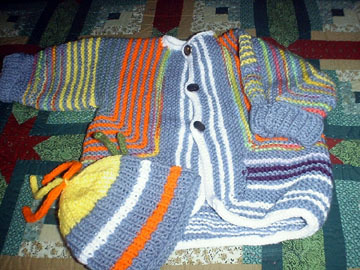 This is a site for avid knitters who love to explore new and easy patterns. You are most welcome to use and reproduce any of these patterns for personal use by yourself or Charity Knitting groups or Guilds. Please do not sell them. If you use them online with a group , please notify me ahead of time. If you have designed a hat and would like to add it to this site, please e-mail the patten to me and I'd be glad to post it, giving you credit for the design. Pull up a chair , get comfy and have a great time knitting hats for some one in need! Hand Knit Hats are a wonderful blessing to local and national as well as world wide charities. 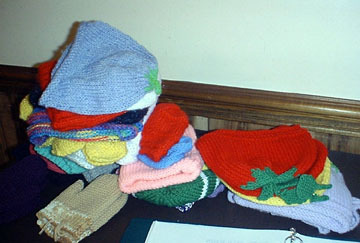 I knit hats for Caps for Kids through my local knitting guild, The Western Reserve Knitting Guild, in Canfield , Ohio. I also knit hats for our county's foster care system (my husband and I are foster parents) as well as our local cancer treatment center, the online group, Knitting 4 Children and some local baby charities. You can get involved by joining any of the online Charity groups at Yahoogroups.com , Children in Common, Guidepost Charities, or by contacting any of your local charity organizations such as the Salvation Army, local hospitals or hospices, shelters in your area and so on. If you need any help locating a group, feel free to contact me. Shapes and colors! Such fun!! to any hand knit gift!